1913 March 11 On Tuesday March 11, 1913, The M. F. W.C held its regular monthly meeting, the President, Mrs S. N. Parsons, presiding. Eleven clubs responded to roll-call. There was a large attendance and it was gratifying to note that the clubs which have recently joined the Federation were well represented. Minutes of last meeting were read and approved. 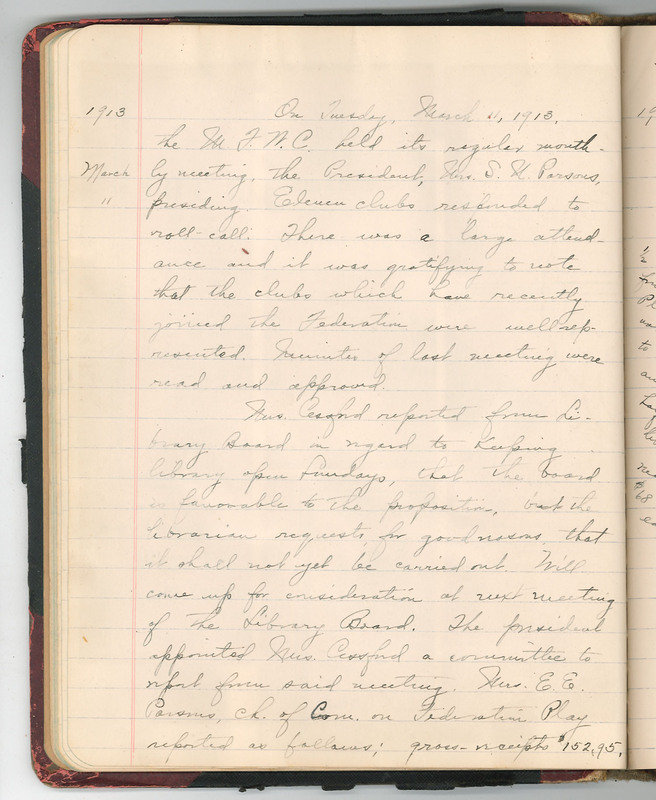 Mrs. Cessford reported from Library Board in regard to Keeping library open Sundays, that the board is favorable to the proposition, but the librarian requests, for good reasons, that it shall not yet be carried out. Will come up for consideration at next meeting of the Library Board. The president appointed Mrs. Cessford a committee to report from said meeting. Mrs E.E. Parsons, Ch. of Com. on Federation Play reported as follows: gross receipts $152.95.